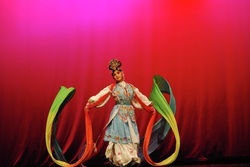 Peking opera features four main types of performers. Performing troupes often have several of each variety, as well as numerous secondary and tertiary performers. With their elaborate and colorful costumes, performers are the only focal points on Peking opera's characteristically sparse stage. They use the skills of speech, song, dance, and combat in movements that are symbolic and suggestive, rather than realistic. Above all else, the skill of performers is evaluated according to the beauty of their movements. Performers also adhere to a variety of stylistic conventions that help audiences navigate the plot of the production. ​ This work is licensed under a Creative Commons Attribution-ShareAlike 3.0 Unported License. Evil Wu dan; female Walk, Male Walk and leading a horse.